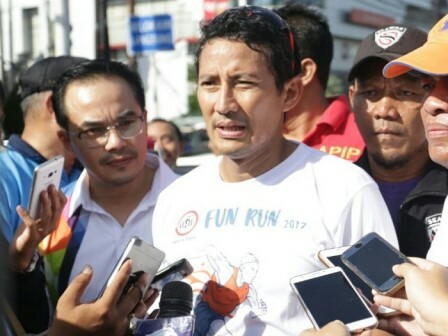 " We're supporting this event, as it relates to healhty lifestyle"
Jakarta Deputy Governor, Sandiaga Uno along with 300 participants participated in Fun Run at Tugu Proklamasi, Menteng, Central Jakarta, Sunday (12/24) morning. The event held by Indonesian Doctor Association (IDI) was aimed to improve the standard of healthy living. In the event, Sandi and participants started to run as far as 6.2 kilometers with route from Tugu Proklamasi - RSCM - Senen - Tugu Tani - Cikini and back to Tugu Proklamasi. "We're supporting this event, as it relates to healhty lifestyle," he stated. In the meantime, Fun Run Committee Chairman, Muhammad Iqbal Mubarak said it was a social service activity. In addition to holding Fun Run, the committee also opened acupuncture booths, basic life support and gymnastics training. "This is the first time held. Hopefully it becomes an annual agenda and it is hoped able to attract more pariticipants next year," he stated.